NADH dose response was measured with Amplite™ Colorimetric NADH Assay Kit in a 96-well white/clear bottom plate using a SpectraMax microplate reader (Molecular devices). Nicotinamide adenine dinucleotide (NAD+) and nicotinamide adenine dinucleotide phosphate (NADP+) are two important cofactors found in cells. NADH is the reduced form of NAD+. NAD forms NADP with the addition of a phosphate group to the 2' position of the adenyl nucleotide through an ester linkage. The traditional NAD/NADH and NADP/NADPH assays are based on monitoring the changes in NADH or NADPH absorption at 340 nm. The short UV wavelength of NAD/NADH and NADP/NADPH assays makes the traditional methods suffer low sensitivity and high interference. Due to the weak absorption of NAD and NADH, the UV absorption method requires large sample sizes, making NAD and NADH measurements unpractical for limited sample size. AAT Bioquest's Amplite™ Colorimetric NADH Assay Kit provides a convenient method for the detection of NADH. The NADH probe is a chromogenic sensor that has its maximum absorbance at 460 nm upon NADH reduction. 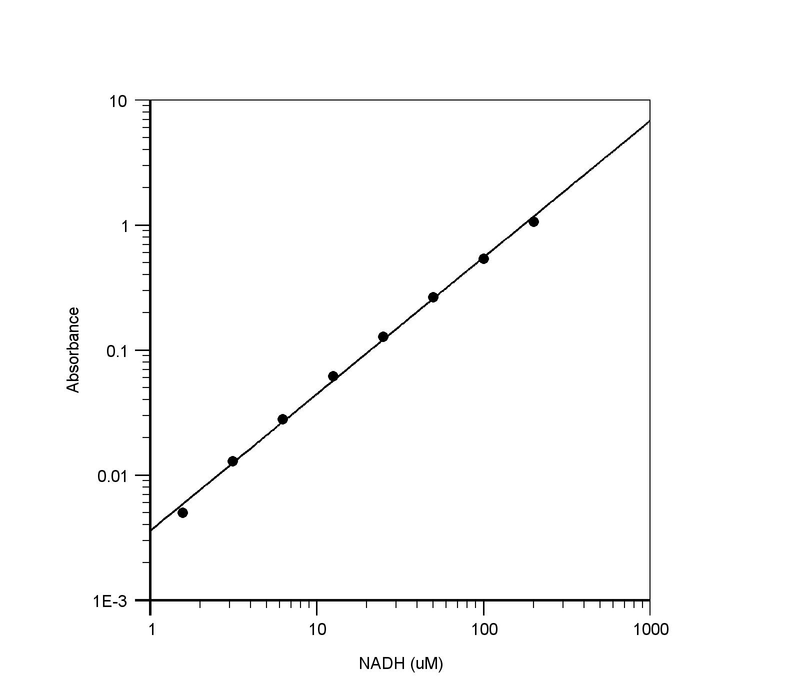 The absorbance increase at 460 nm is directly proportional to the concentration of NADH in the solution. The NADH probe can recognize NADH in an enzyme-free reaction, and the signal can be easily read by an absorbance microplate reader at ~460 nm. The Amplite™ Colorimetric NADH Assay Kit provides a sensitive assay to detect as little as 3 µM NADH in a 100 µL assay volume. The assay can be performed in a convenient 96-well or 384-well microtiter-plate format. Add 100 μL of 1 mM (1 nmol/µL) NADH standard solution into 400 μL PBS buffer (pH 7.4) to generate 200 μM (100 pmol/μL) NADH standard solution (NS7). Take 200 μM NADH standard solution and perform 1:2 serial dilutions in PBS to get serial dilutions of NADH standard (NS6 - NS1). Note: Diluted NADH standard solution is unstable, and should be used within 4 hours. Add 1 mL of NADH Probe (Component A) into 4 mL NADH Assay Buffer (Component B) and mix well to make NADH working solution. Note: 5 mL NADH working solution is for one 96-well. Table 1. Layout of NADH standards and test samples in a white/clear bottom 96-well microplate. NS= NADH Standards (NS1 - NS7, 3.13 to 200 µM), BL=Blank Control, TS=Test Samples. Prepare NADH standards (NS), blank controls (BL), and test samples (TS) according to the layout provided in Tables 1 and 2. For a 384-well plate, use 25 µL of reagent per well instead of 50 µL. Note: Prepare cells or tissue samples as desired. Lysis Buffer (Component D) can be used for lysing the cells for convenience. Add 50 µL of NADH working solution to each well of NADH standard, blank control, and test samples to make the total NADH assay volume of 100 µL/well. For a 384-well plate, add 25 µL of NADH working solution into each well instead, for a total volume of 50 µL/well. Incubate the reaction at room temperature for 15 minutes to 2 hours. Protect from light. Figure 1. NADH dose response was measured with Amplite™ Colorimetric NADH Assay Kit in a 96-well white/clear bottom plate using a SpectraMax microplate reader (Molecular devices).